Strolling street band for hire. Hindi, English and Bhojpuri lyrics combined with the sounds of Soca, Calypso and Filmi music. Hindi, English and Bhojpuri lyrics combined with the sounds of Soca, Calypso and Filmi music…CHUTNEY! 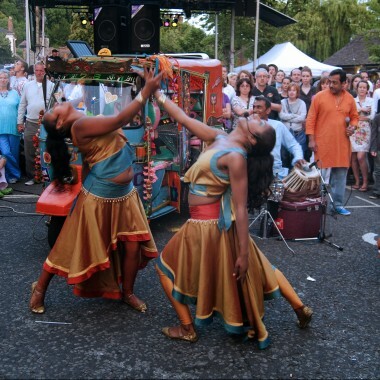 will entertain you with the story of a Magic Rickshaw using up-tempo songs and vibrant, interactive dance sequences inspired by the sounds of the Indo-Caribbean. Chutney! is a new strolling street band and programme of music led by renowned British Asian musician/composer Kuljit Bhamra. Kuljit has written hit songs, film scores and West End musicals. He is also a pioneer of the worldwide Bhangra phenomenon, combining traditional Indian rhythms with western instruments and multi-track recording techniques. 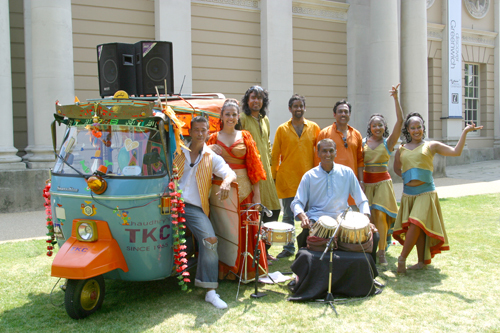 The inspiration for this band is “Chutney” music, the popular musical style of the Indian community in Trinidad that blends influences from Asia and the Caribbean. A spicy mix of tabla, guitars and percussion! Chutney! is a Without Walls Commission supported by XTRAX and gratefully acknowledges financial support from the PRS for Music Foundation.